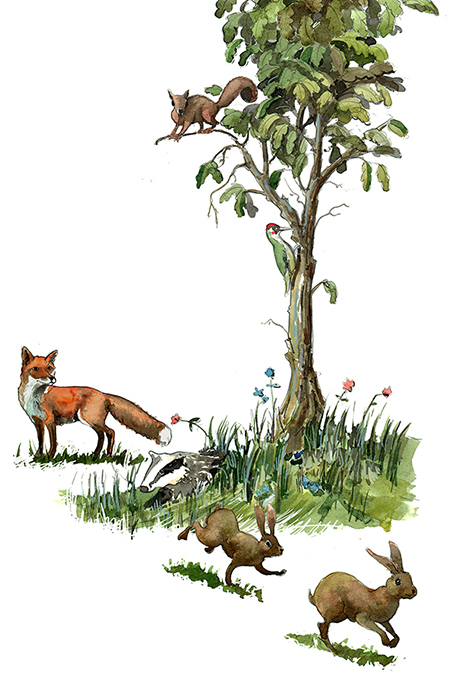 BBC Countryfile Magazine contacted me again to produce another illustration based on using SmartPhones to track down, and conserve wildlife. As a species, for the first time in our history, we have become networked. We carry phones. We check our status updates. We share videos of our friends and our families and, inexplicably, YouTube videos of cats doing ridiculous things. We are the generation most removed from nature and technology is why, we’re told. But what if it’s not? Could screen-time, so often vilified for removing us from nature, also be the thing that better links us to it? 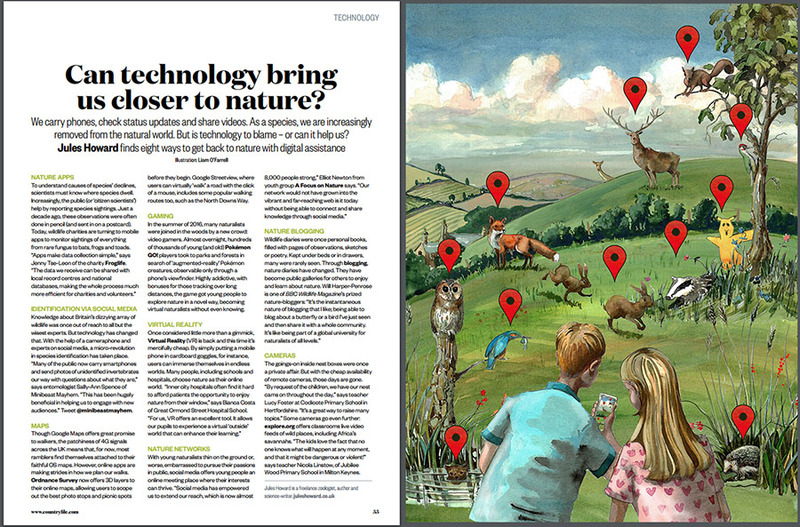 In the article Jules Howard meets the people who, far from being distanced from nature, are engaging and exploring nature in new ways courtesy of the technology that sits within their pockets. I decided to do a couple of children looking through a SmartPhone at a number of British wildlife species. 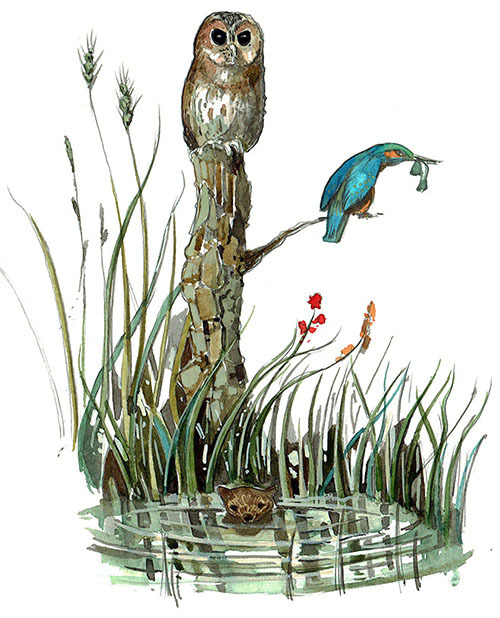 Of course, in reality, wild life is never that cooperative when it comes to showing itself, though with the fantasy world of illustration anything can happen. With that in mind, I packed in a good few illustrations across the landscape and added a Pokemon for good measure. I really enjoyed working through this project as each section was a small nature study in itself. That said, I didn’t want them exactly anatomically correct as I felt it needed a bit of playfulness to counter what might be initially perceived as a dull article. BBC Countryfile Magazine is packed full of fresh and interesting ideas for exploring Britain’s beautiful landscape, watching wildlife, discovering heritage and great local food. With our expert writers you can explore the best walks, nature reserves, market towns and villages, and discover new places to eat and stay, as well as showing you the hidden places in the countryside that others overlook. “The countryside makes us happy. So follow BBC Countryfile Magazine on dozens of thrilling journeys into enchanting landscapes every issue through gripping features and tried and tested walks. Along the way, you’ll read the latest from the Countryfile presnters and discover the natural and human history that infuses our unique surroundings – as well as romantic places to stay and the perfect country pubs for well-earn refreshment. With stunning photography and the finest line-up of rural writers in the land, BBC Countryfile Magazine is your monthly escape to rural bliss – you have our word” – Fergus Collins, Editor. So creative and full of joy, I adore it! Many thanks for that. Most appreciated.